The Indianapolis Colts were outplayed both offensively and defensively as the Kansas City Chiefs booked a slot in the AFC Championship game with a 31-13 win. 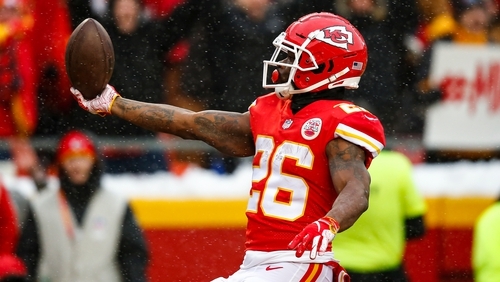 The Chiefs were on the board after just five minutes at a chilly Arrowhead Stadium, with Damien Williams scoring on a 10-yard rush. Tyreek Hill doubled the lead with a scoring rush of 36 yards less than five minutes later and quarterback Patrick Mahomes - 27 of 41 for 278 yards - also ran in for a score. The Colts' sole score in the first half came off the back of a blocked Dustin Colquitt punt which was returned by Zach Pascal for a touchdown. Andrew Luck hit TY Hilton for a score late in the fourth as a consolation, but Darrel Williams secured the win with a TD as the Chiefs advance and are one win away from the Super Bowl. Sean McVay became the youngest ever head coach to win a play-off game as the Los Angeles Rams saw off the Dallas Cowboys 30-22 in the NFC Divisional Round. The Rams, coached by the 32-year-old, had 272 yards rushing and another 186 through the air with a strong offensive performance at the Memorial Coliseum. Los Angeles took charge in the second quarter with CJ Anderson and Todd Gurley both finding the end zone for rushing touchdowns. Dak Prescott made it an eight-point game with just over two minutes left to play, but the Dallas defence gave up a pair of first downs and Jared Goff ran the clock down with a pair of kneels.